Last week I showed you how to connect your Mac to the Internet and to a local network. Now that your computer is on speaking terms with other devices and services, let’s examine exactly how you can put those powers of communication to use for sharing the devices and files associated with your Mac. To share elements of your computer with others, you must first grant permission for certain kinds of sharing to take place. You do this via the Sharing system preference, which you’ll find in the Internet & Wireless section of Mountain Lion’s System Preferences window. Once you’ve selected Sharing, you’ll see a number of options. We’ll start by looking at the ones you’ll use most frequently. 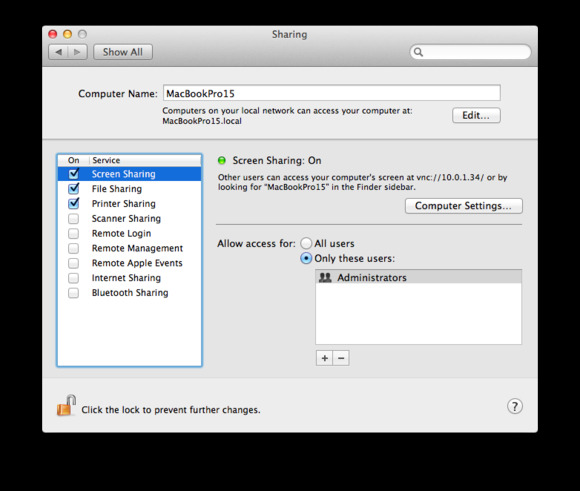 Screen Sharing: This feature lets you remotely view the screen of another Mac on your local network, as well as optionally control that Mac. It has been part of the Mac OS for quite some time, and with Mountain Lion it’s dead simple to use. To allow someone to share your screen, you must first make the option available. To do that, open the Sharing preference and enable the Screen Sharing option. Once you’ve enabled Screen Sharing, you can designate exactly who may exercise this privilege. By default, only people who have an Administrator’s account can share your screen. You can also allow specific users or groups from your list of contacts to screen-share with you. To do this, confirm that the Only these users option is selected, click the plus (+) button, choose Contacts or groups in the contacts sheet that appears, and click Select. This action will add them to the list of users who can request screen-sharing access. If you enable the All Users option instead, anyone who can see your computer on the local network can share your screen. To share your screen, all that someone on your network need do is select your Mac under the Shared heading in a Finder window’s sidebar and then click the Share Screen button that appears near the top-right of that window. The person will be prompted to provide an approved username and password for the shared Mac. Alternatively, the would-be sharer can enter the Apple ID associated with that Mac. Simply clicking Connect completes the connection. We’ll discuss the ins and outs of screen sharing in another column. File Sharing: If you enable File Sharing, others on your network can, well...share files with you. Setting up this arrangement doesn’t entail granting them complete access to your Mac. Rather, it allows them to copy files from their Mac into folders on your computer that were created specifically for sharing. By default, one such folder exists for precisely this purpose. It’s called the Drop Box folder and you can find it by following this path: youruserfolder/Public/Drop Box. Each user account has such a Drop Box folder. The Drop Box folder earns this name by providing a folder destination that others can copy files to, but without being able to see other files that it may contain. Think of it as being akin to the company Suggestion Box—the padlocked one that has a slot in the top for inserting notes that complain about Margie in Accounting. You can place all the disparaging notes you like in that box, but only the person with the key can view them. The Drop Box within a user's Public folder. In order for people to copy items into your account’s Drop Box, they must first select your Mac from a Finder window’s sidebar. The word 'Connecting' will appear at the top-left of the window, and within that window will appear the names of all user accounts on that Mac, followed by 'Public Folder'. So, for example, 'Chris’ Public Folder'. Double-click this folder, and you'll find the Drop Box folder within. If you try to open the Drop Box folder, your Mac will inform you that you can’t pry it open because you don’t have permission to. However, you can drop things into it, at which point they’ll be copied to the Mac that hosts the folder. You can create other folders on your Mac for sharing. To do so, move to the Finder and choose File > New Folder (Shift-Command-N) to create a new folder on the desktop in the window that appears. Select that folder, choose File > Get Info (Command-I), and enable the Shared Folder option. This folder will appear as a shared folder from another Mac on the network. Simply designating the folder as shared doesn’t complete the picture, however. You must also decide what kind of access others should have to the folder. At the bottom of the Info window that remains open, click the triangle that appears next to Sharing & Permissions. You’ll see three listings: your username, 'Staff', and 'Everyone'. Next to your user name will be the words 'Read & Write'. 'Read only' appears next to 'Staff' and 'Everyone'. Setting access privileges for a shared folder. With the settings in this configuration, people on other computers can see what’s in the folder and can copy items from it to their Macs. They can’t, however, add files to the folder. You might set up a folder with these characteristics as a “come-and-get-it” folder where family members or coworkers can go to pick up specific files, without being able to fill the folder with their own stuff. You can change that folder behavior easily enough, if you wish to. Click the Read Only entry next to Everyone, and you'll see four options: Read & Write, Read Only, Write Only (Drop Box), and No Access. Read & Write permits anyone with such access to take items out of the folder and to put items into it. I’ve already explained what Read Only does. Write Only describes the behavior of a Drop Box folder: A networked user can place items in it, but can’t otherwise access the folder’s contents. And No Access means that others don’t have permission to access the folder in any way. Why does Apple include a No Access option? Within this same area, you can add other users. Some you may wish to grant access to, while others you may want to keep strictly out. If you’re afraid that Margie’s feelings may be hurt by comments regarding her work ethic, assign her No Access privileges for that folder. Printer Sharing: At one time, if you wanted to share a printer with other computers on your network, you had to purchase a model that sported an ethernet jack and then incorporate the thing into a wired network. Those days are long gone—and not only because many printers today support Wi-Fi. You can share printers that have no wireless capabilities whatsoever. And the way you do it is with the Printer Sharing option. 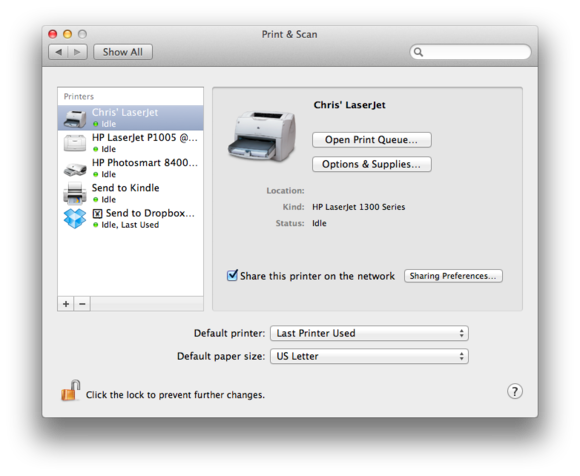 You can enable printer sharing from within the Print & Scan preference. Scanner Sharing: See "Printer Sharing." Same idea.